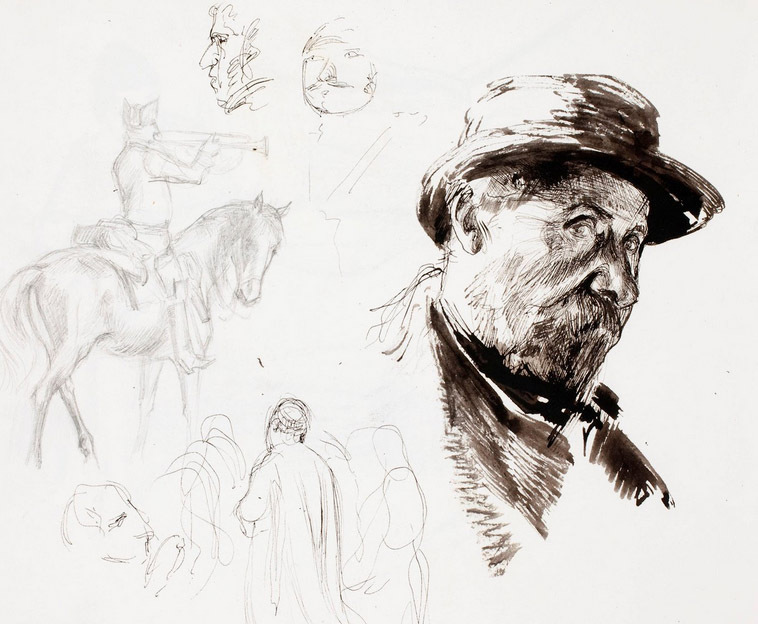 The Finnish National Art Gallery has released online the sketchbooks of Albert Edelfelt (1854-1905). Since the 104 sketchbooks are in chronological order, you can trace the journey of his mind and see the people he met and the moments he lived. 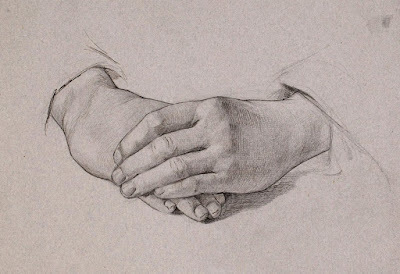 The books begin in his youth and reflect his early exposure to academic drawing at the Drawing School of the Finnish Art Society. He also studied with Adolf von Becker and later with Jean-Léon Gérôme at the Ecole Nationale des Beaux Arts in Paris (1874-1878). 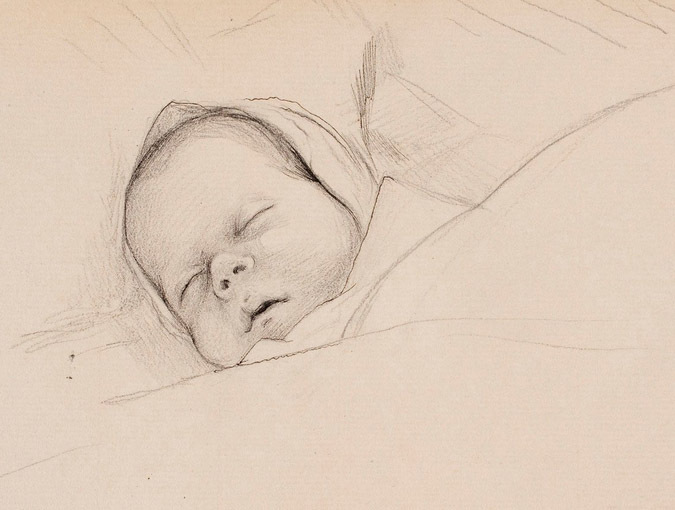 There are babies newly born and relatives on their death bed, both common subjects of 19th century artists. Edelfelt had a special gift for painting children. 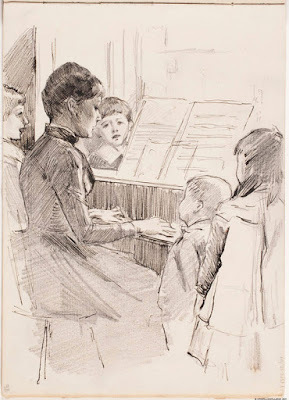 His sketchbooks reflect unselfconscious moments of children's lives, such as musical evenings, and kids at play. 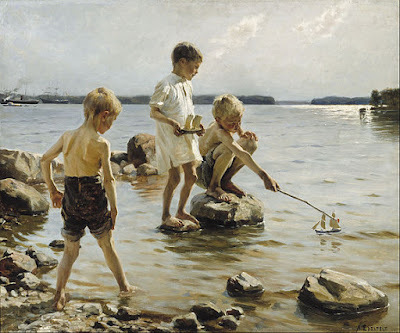 Here's one of his finished paintings of children, for which he is justly revered not only in Finland, but around the world. 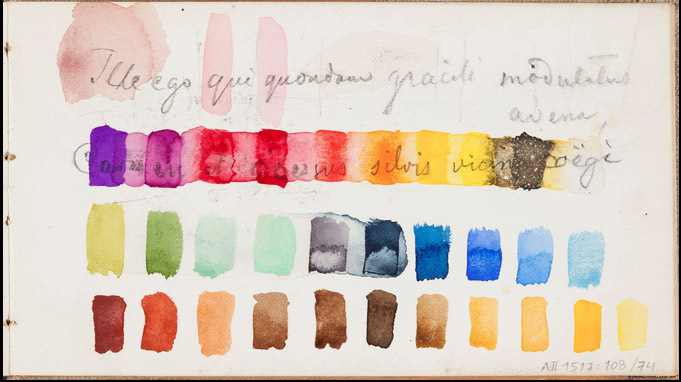 Don't miss his copies of Sargent in #19, dissections in #22, studies at the Prado in #27, and testing out a watercolor set in #100 (above). Thanks to the Finnish National Gallery for making these works accessible to the public, and thanks to Finnish illustrator Ossi Hiekkala (check out his work) for letting me know about it. Hi, Nicolai, I don't think they make exactly the same waistpack anymore. Whether this one is right for you depends on how much stuff you carry and how big it is. I am asking because I am not that much in finding the sizes inside the waistpack. I tried to find the bags that are similar to measurements of yours because i carry same things. They are actually available in my country (bags in the links). I just don't know how do they measure bags in liters. thanks I always love seeing sketchbooks. I saw a Mucha Show about 10 years back in Worchester, and they had a bunch of his sketchbooks opened to random pages in a glass case and I just want to see them all! Speaking of sketchbooks, have you ever considered releasing any of yours either in printed or pdf form? I know of several artists online who do that and it is much more insightful than the usual "best pages" collections that some call "sketchbooks". Michael, thanks for asking. I do have plans to release complete ebook editions of my own sketchbooks, which you'll be able to go through page by page with scalable images and links to behind the scenes content (in most cases, photos, step by steps, audio, and video clips. I'll need an app developer who can help create the template. I am very happy to find your very interesting art blog !!! In London this past June, we wandered into a bookstore near Covent Garden and I found and purchased a sketchbook of an English soldier of World War One. He was stationed in Galipolli in 1915. I have put four of the pages up on my FLICKR page at: https://www.flickr.com/photos/sketchrboy/ I love the idea that sketchbooks are scanned and saved. Do you know of any such project in the United States? I have over 40 years of sketchbooks and can imagine what a rich treasure could be made of the sketchbooks of so many.